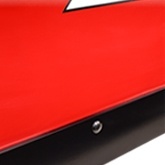 The base angle is the assembly on the bottom of a trip-edge style snowplow, such as the Trip Edge Straight Blade or DXT, that makes actual contact with the ground. On a Trip Edge Straight Blade plow, the base angle is attached to the back of the plow by a set of two arms. These arms then connect to a bar and spring mechanism that allows the base angle to complete its purpose: a tripping action. When the snowplow encounters and hits an object, the bar and spring allow the base angle to "trip" backward and spring back into place, avoiding maximum impact. The DXT plow base angle is attached differently using a series of pins and torsion springs, but it still completes the same purpose. Additionally, the DXT base angle comes with a curb guard and bolted on snow catchers. Overall, the base angle is the part that helps protect both the plow and truck from unforseen obstacles that may appear on the job. Because the bottom of the plow makes actual contact with the ground, it takes on a lot of wear and tear. The main job of the cutting edge is to provide an extra layer of protection to the bottom of the plow. The cutting edge is an attachment that fastens on to the bottom of the plow directly on top of the base angle. When the cutting edge gets worn down, it can simply be discarded and replaced. The idea is to wear out an easily replaceable piece, rather than wearing out the actual plow itself. 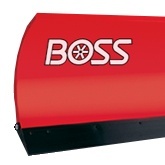 All BOSS Trip Edge snowplows - besides the DXT - come standard with a cutting edge. The great thing about the DXT plow is that you do not need the cutting edge right away. The base angle can be used as your initial wear edge, and it can provide roughly two inches of wear protection. When it is time to install a cutting edge onto a DXT, you simply remove the bolted snow catchers and apply the new cutting edge on top of the base angle. This new cutting edge will come with built-in snow catchers made specifically for the DXT. For all other plows, the cutting edge will come bolted onto the plow. Once this cutting edge is worn out, discard the old part and attach the new cutting edge on top of the base angle. Click HERE to view a video further distinguishing these parts!